The Dymaxion House / Wichita House is a house suspended from a central mast. 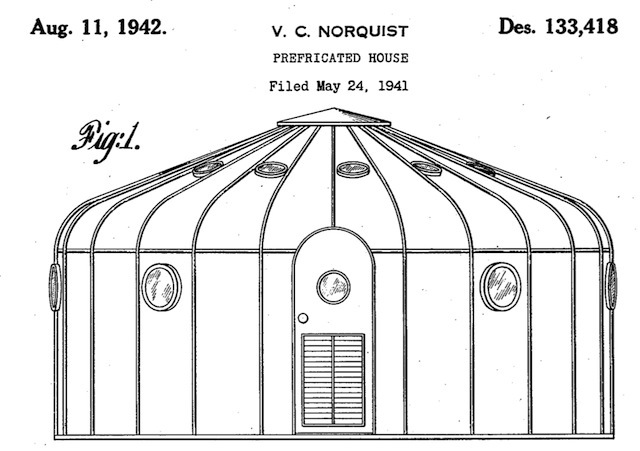 The Dymaxion House / Wichita House of 1946 has no patent. In Inventions Fuller directs the readers to Grunch of Giants as to why the Dymaxion House did not go into production. Grunch of Giants claims this was due to a lack of a distribution system, difficulties with building codes, resistance from electricians and plumbers unions and an unwillingness by banks to offer mortgages. But there is no published explanation why Fuller or someone else did not patent the Dymaxion House. Grunch claims the Dymaxion House was designed in 1927, modeled in 1928 and helicopter-delivered in 1954. The Wichita House appears in Dymaxion World illustrations 184-227. Much of Fuller Houses by Federico Neder concerns the Dymaxion House. The most important information on why the Dymaxion House never went into production can be found on pages 85-114 of Martin Pawley’s Buckminster Fuller. Namely, this was due to Fuller’s “fanatical determination to retain complete personal control of the project and refine the house still further before putting it into production.” Although there were estimates of 250,000 Dymaxion Houses to be produced each year and 37,000 unsolicited orders before production began, not one complete full scale Dymaxion House was ever made. When the Henry Ford Museum attempted to restore the full size Dymaxion House, they learned that what is seen in photographs are two incompatible models, an interior and exterior. Only miniature models exist in complete form. The Dymaxion House was one of Fuller’s best opportunities for financial success. Funding was available, materials and equipment was at hand, trained labor stood ready, but Fuller scuttled the entire operation. The challenges Fuller described in Grunch of Giants may have existed, but these challenges exist for every manufacturer and architect and designer who, nonetheless, are able to produce their work. Fortune magazine described the Dymaxion House as the industry that industry missed. How the Dymaxion House was scuttled is underdocumented. The documentary Thinking Out Loud claims that the manufacturer was ready to proceed but Fuller objected, claiming the need for more testing. In Buckminster Fuller: An Autobiographical Monologue / Scenario (edited by Robert Snyder) Fuller speaks of the Dymaxion House being ready for mass production but says nothing about why this did not happen. J. Baldwin writes: “To prevent the marketing of an unperfected product, he ‘hid’ the engineering drawings by stamping them ‘obsolete. '” How Fuller was able to walk away with a design he did not own the intellectual property to is unknown. [The] Dymaxion House was probably the worst planned dwelling in the world. A round, small round space. Unless you’re an igloo, unless you like igloos and live like Eskimos in one room. But he believed in privacy, so he carved it up and made rooms at the beds. If you look at the plans today it is to laugh. The bed never got into the pie shape, pie shape room. There’s no way architecturally to make it work. But he tried anyhow. And he put an arched door in this mechanical looking thing. And then he held it up in the central mast. Well if there’s one way not to hold up a house, it’s from the center. Frank Lloyd Wright tried the same thing you know. I mean it was in the air. It was in the air. A lot later it went into art through Snelson but in engineering it lasted for a long time. You hold down a building on the outside and hold it up in the middle. Well isn’t it easier, any common person would say, to hold it up all over? Why do you hold it all up and then pull it down again? Never made any sense. But ideologically it made wonderful sense. 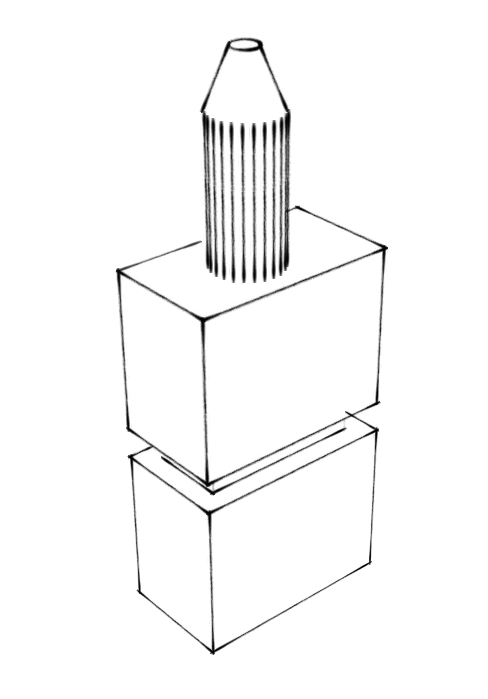 We have this central mast – you could see the poetry that would fit around a circular building around a mast. Perfect. Had nothing at all to do with architecture and all to do with dreams and pseudo mechanics. Fuller describes an overhead-trolleyed, tensionally supported telephone in Dymaxion World. This appears to be a candlestick telephone hanging from a track that could be slid between desks in an office. Fuller never sought a patent for this telephone trolley. Fuller describes a criss-cross, tensionally supported table in Dymaxion World. This appears to be a table supported by wires. Fuller never sought a patent for this table. Furniture suspended from above is as old as the first porch swing or folding table on a ship, but this particular suspended table is somewhat novel. Fuller never sought a patent for this tensionally supported table. For the purposes of navigation it is important to have maps or charts on flat or plane sheets which fulfill three mathematical conditions. First, the construction should be such that it will be convenient to draw on the map the course of the shortest sea-level line between any two points, and to ascertain the latitude and longitude at any intermediate point of the course. Such a line is commonly known as the arc of a great circle and would be if the earth were a true sphere but is in, fact a line to be otherwise defined since the earth approximates closely to a spheroid or ellipsoid of revolution, and will be termed a geodesic line. Second, it should be convenient to ascertain the angle at which any geodesic line crosses any intermediate meridian. The ideal way to study the world is by use of a globe, and all geographers are agreed on this point, it follows that a map which is identical with the surface of a globe, laid out literally on a plane, must be the best as being nearest to an actual globe. […] I will go further and say that a map so made has advantages that a globe has not. One of them is that the map shows the entire world at one coup d’il, whereas on a large globe one can only see about a third of the earth’s surface at one time. 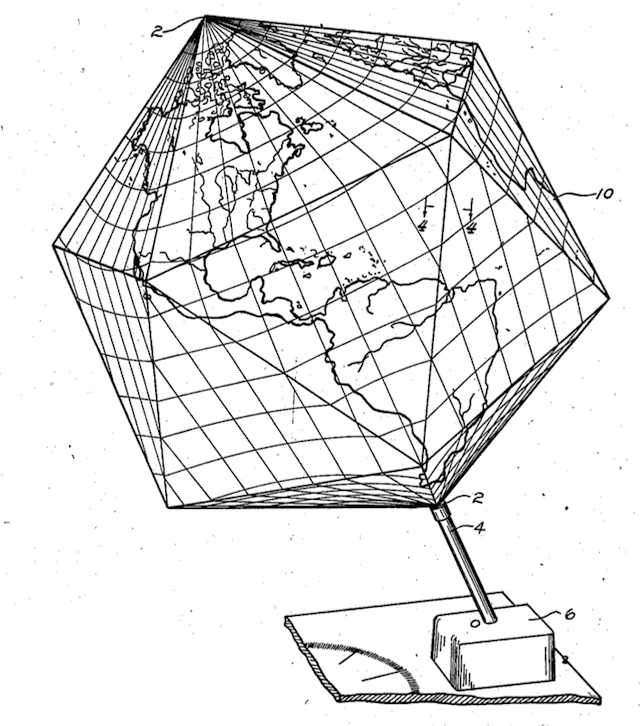 The patent specifies that the Dymaxion Map is “resolved into six equilateral square sections and eight equilateral triangular sections.” This does not describe the icosohedral Dymaxion Map (known as the Raleigh projection) that is often associated with patent 2,393,676. 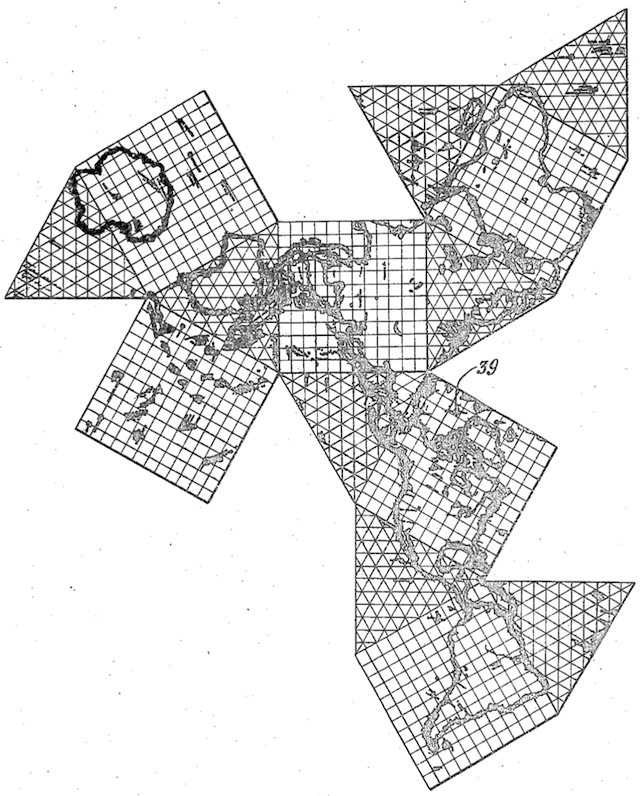 Inventions mentions the Dymaxion Map in Life magazine, but not one of the ways in which this “flat map shows [the] world in many perspectives.” This was the “Jap Empire.” “The ruthless logic of the Jap imperialism is exposed by this layout of the Dymaxion World map. The “Jap Empire” was not included in the reprint from Life found in Dymaxion World page 153. 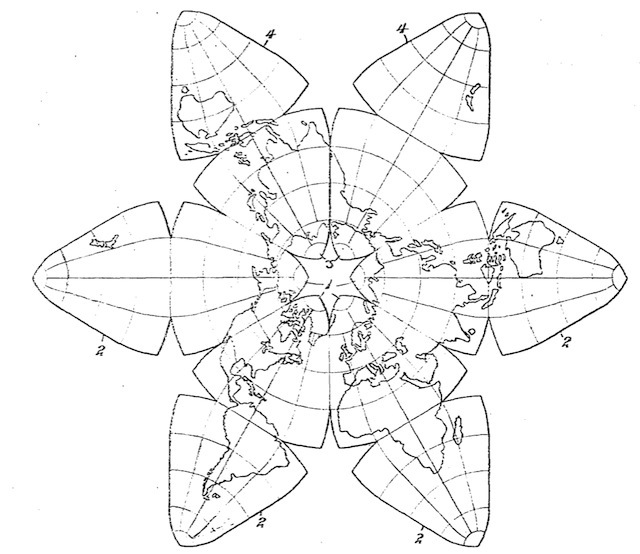 The Dymaxion Map is preceded by similar inventions, although there is no indication that Fuller was aware of them. The Jitterbug Transformation appears in Fuller’s work starting in 1948, as part of his study of the closest packing of spheres. What Fuller discovered was that a wire-frame cuboctahedron with flexible vertices has the property of flexing into other shapes. If the upper and lower triangular face are pushed toward each other, the cuboctahedron forms a shape similar to the icosahedron (although missing some edges). If the upper and lower triangles are pushed further toward each other, the cuboctahedron forms an octahedron. A flexible cuboctahedron can be manipulated further to form a tetrahedron and a triangle. These transformations were entirely the discovery of Buckminster Fuller. The Autonomous Package is a collection all the furniture and utilities needed by a family of six packed into a single container. The Autonomous Package was developed by Fuller and students at the Dearborn Street Institute of Design in Chicago, Illinois in 1948. This project predicted the utility of intermodal containers, standardized containers that can be filled and delivered by air, sea and land without being repackaged. This project also predicted the popularity of stores like Ikea, which sells collections of furniture and utilities in ready-to-assemble form. Fuller never attempted to patent the Autonomous Package. 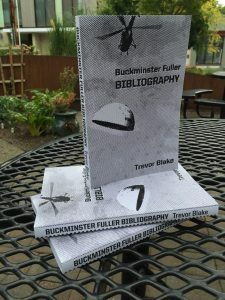 In Dymaxion World he write that the Autonomous Package was “not significant in its superficial results.” The Autonomous Package is a case of Fuller demonstrating the feasibility and cost-effectiveness of a technique then moving on, with the world adopting his discovery while not knowing its origin. 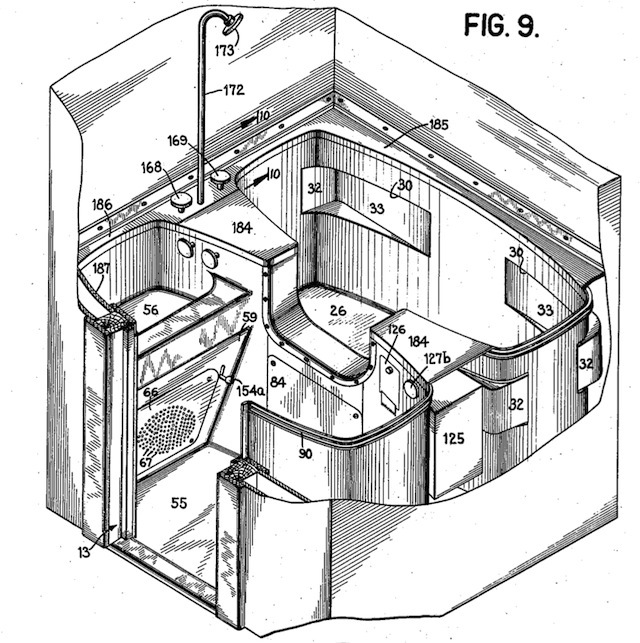 While not limited to use on a Dymaxion Dwelling Unit, this patent was assigned to the Dymaxion Company. 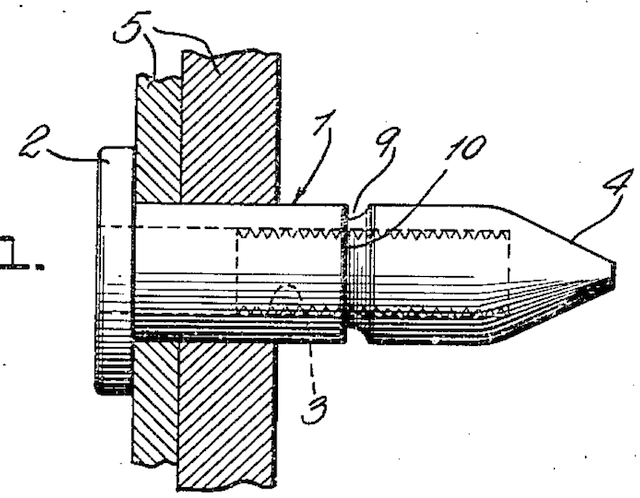 In some cases Fuller was able to give partial credit to prior inventions, or to share the stage with other inventors. James Monroe Hewitt’s patent 1,633,702 for Building Structure (28 June 1927) appears in both the Chronofile and Inventions. 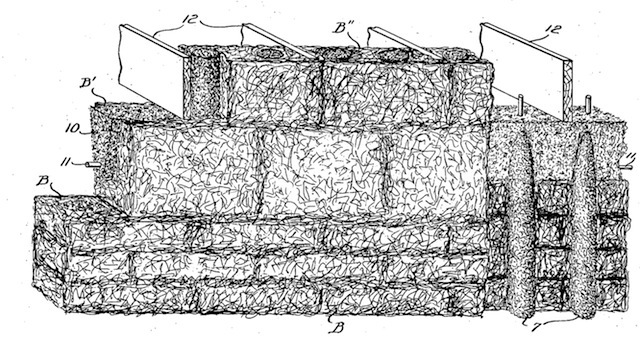 Hewitt’s earlier patent 1,631,373 for Partition Walls (7 June 1927) appears in the Chronofile but not in Inventions. 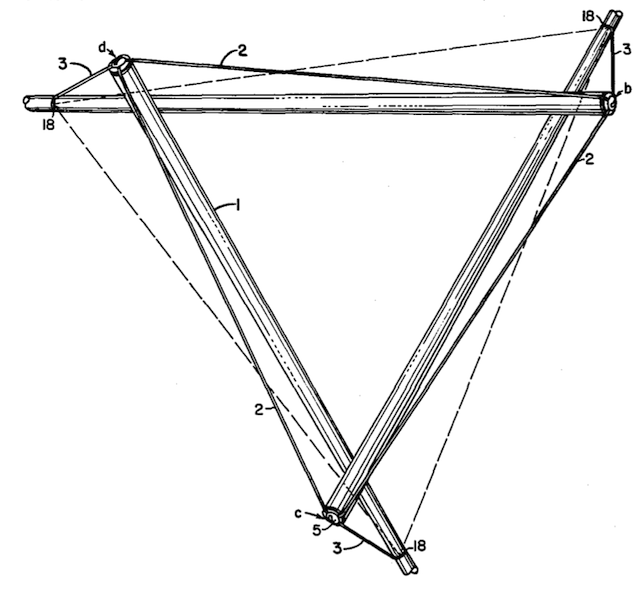 The Tensegrity Trus of Christopher J. Kitrick appears in Inventions. But the Dymaxion patent for Fastening Means is lost in the Fuller literature. The Geodesic Dome is a shelter shaped like an inverted bowl. The Geodesic Dome is called Building Construction in patent 2,682,235 (29 June 1954). The photograph on page 128 was taken inside the Climatron in St. Louis, Missouri USA. The photograph on page 138-139 was taken outside the U. S. Pavilion at the Montreal World’s Fair. It is unknown where the photographs on pages 132, 1134-135 were taken. 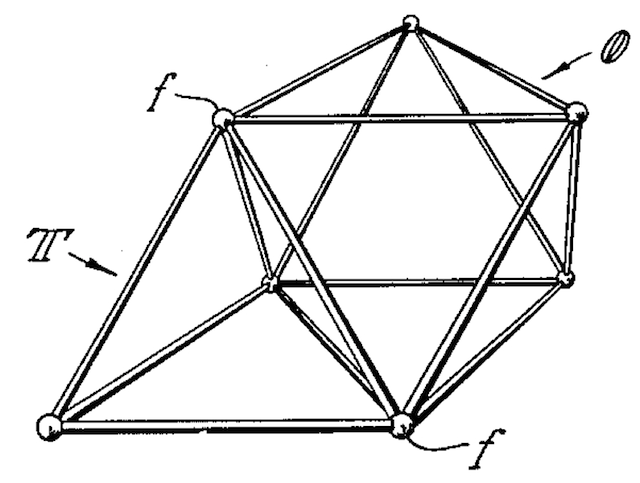 Fuller’s U. S. patent was granted on 29 June 1954, his Canadian patent in 1955, but this is not the first patent for a geodesic dome. The first patent for a geodesic dome was awarded to Walter Bauersfeld (1879-1959) in 1925. Bauersfeld’s patent is Reichspatentamt Patentschrift Nr. 415395 Klasse 37a Gruppe 2. 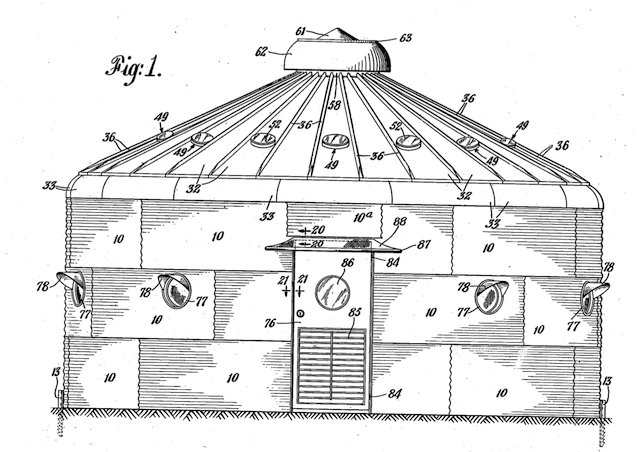 A U. S. patent preceding Fuller’s geodesic dome is Insulation for Spherical Tank Shells and Methods for Making the Same (2,470,986), granted to J. O. Jackson on 24 May 1947. 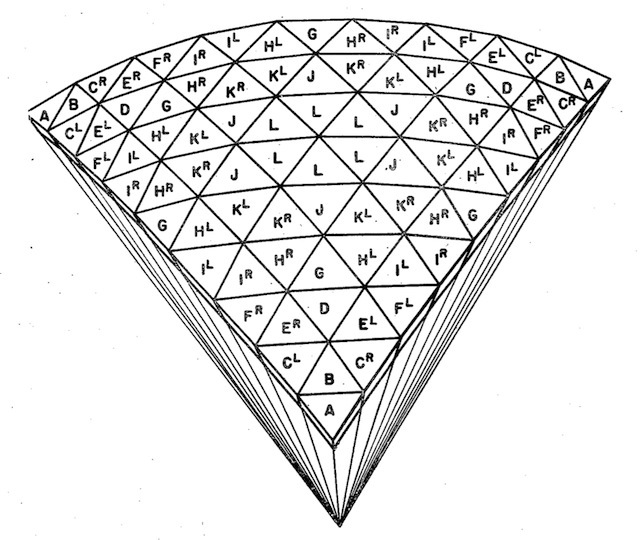 Jackson’s patent describes the faces of an icosahedron divided into any number of triangles, the projection of the vertices of these triangles outward until they intersect with the surface of a sphere, then connecting the points of intersection with radial lines forming the chords of great circles. 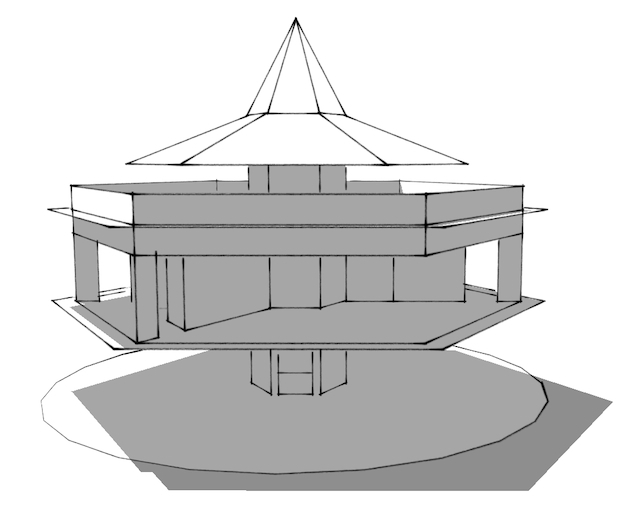 The resulting “dome-like” structure is described as “less troublesome, costly, and wasteful” as conventional structures. 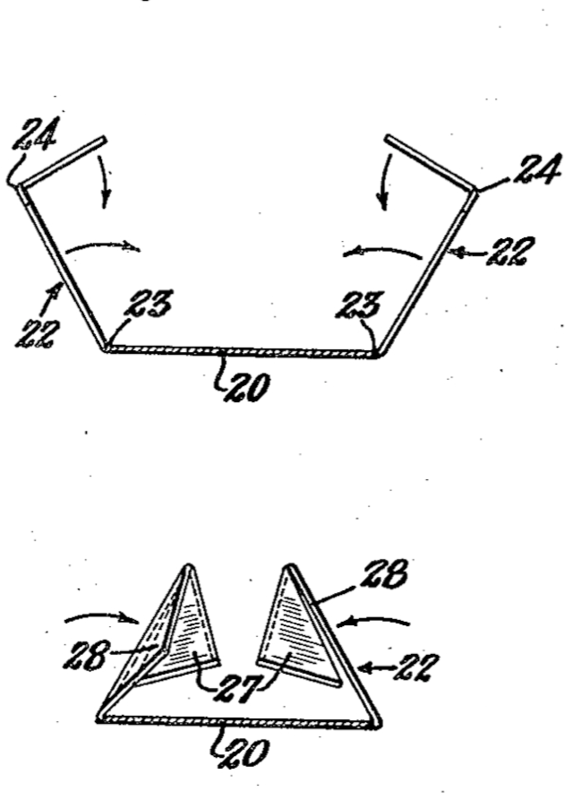 Jackson’s patent, in turn, makes reference to patent 2,424,601 – Icosahedral Map by J. E. Crouch, granted on 29 July 1947. The Geodesic Dome is preceded by similar inventions, although there is no indication that Fuller was aware of them at the time of his patent. The Paperboard Dome is a kind of Geodesic Dome, made of folded cardboard tubes and panels. The Paperboard Dome is called Building Construction in patent 2,881,717 (14 April 1959). Canadian patents were awarded the same year. 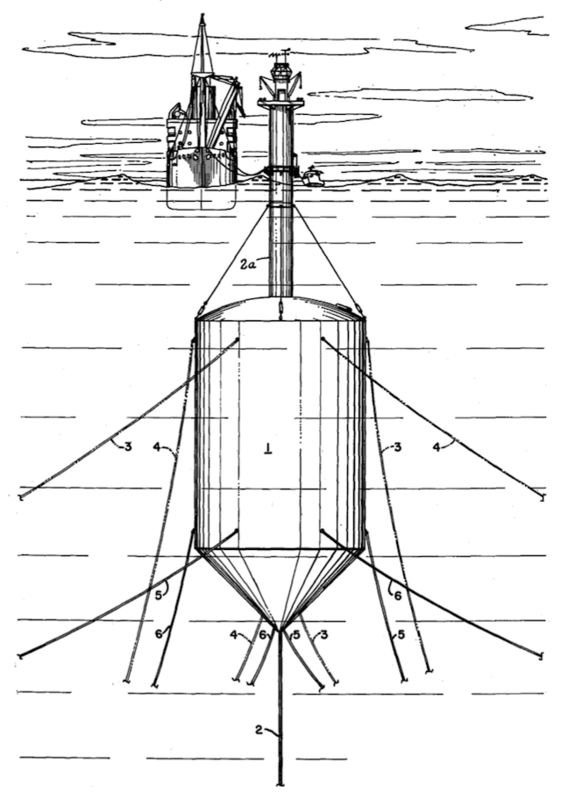 The photograph on page 146 features the 1954 Mark II dome, which can be seen in illustrations 426-433 of Dymaxion World (see also Military Domes). The twenty-foot paperboard dome and the Lower East Side gang that built it mentioned by Fuller is described at length in CHARAS by Syeus Mottel. 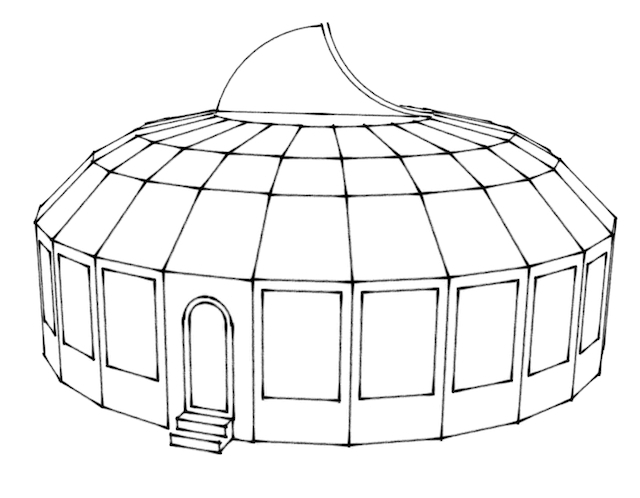 The Paperboard Dome, as a dome, is preceded by similar inventions. But the use of what is now known as cardboard in this folded form is unique to Fuller. The Plydome is a kind of Geodesic Dome, made of overlapping sheets of plywood. 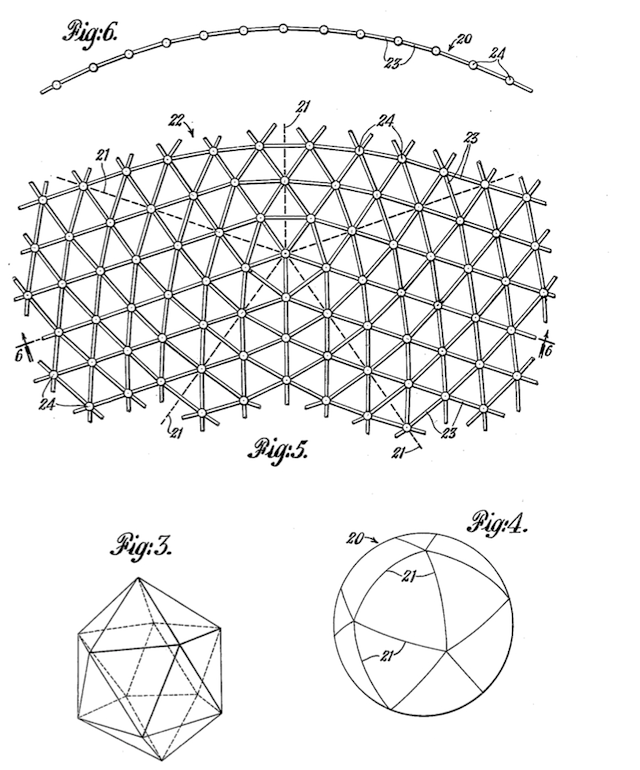 The Plydome is called Self-Strutted Geodesic Plydome in patent 2,905,113 (22 September 1959). Dymaxion World illustrations 435-442 show other plydomes. The Geodesic Plydome chapel of Colombian Fathers in illustration 447 was built in 1957, the year Canadian patents for the Plydome were awarded to Fuller. The PlyDome, as a dome, is preceded by similar inventions. But while shingling is an old architectural form, shingles-as-roof-and-walls is a form unique to Fuller. The Catenary (Geodesic Tent) is a kind of Geodesic Dome, made of a tent suspended from a metal geodesic frame at multiple points. The Catenary Dome is called called Geodesic Tent in patent 2,914,074 (24 November 1959). The Alaskan dome mentioned by Fuller was built by Synergetics Inc. of Raleigh NC USA in 1956. The 100-foot diameter dome was erected, disassembled, shipped and re-assembled in Afghanistan, Algeria, El Salvador (twice), France, Osaka (Japan), Peru, Syria, Thailand, Tokyo (Japan) and Uruguay before its use in the 1967 Alaskan Centennial. This was one of the most field-tested domes ever made and there is no record of it having given sub-standard performance. One wonders what the town of Fairbanks did with the dome after it was disassembled. The second Dymaxion Car vanished for decades. Perhaps the Alaska dome will likewise make a dramatic reappearance. 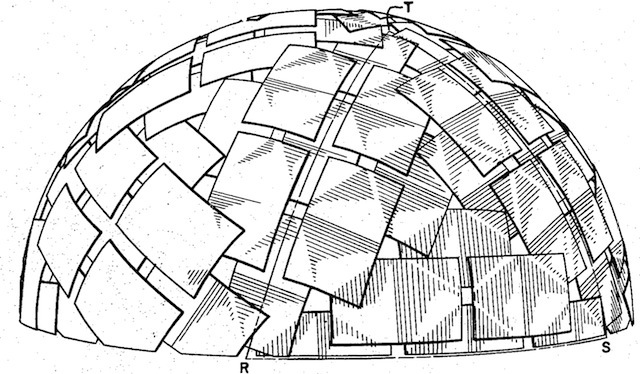 The Cantenary Geodesic Tent, as a dome, is preceded by similar inventions. But the application of circus-tent like structures to the dome’s facets is a form unique to Fuller. Millions of modern camping tents, with their dome shape supported by tension members, owe their existence to Fuller’s Cantenary Geodesic Tent.